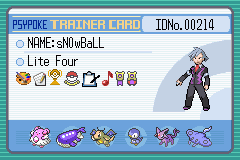 Hi, I have mixed feeling about using legendary Pokemon for battles, it seems kind of dirty because of their massive strengths.....so I don't dare try to use them. I wanted to know yalls opinions about Legendaries and if you guys have the same feeling as I? I don't really know, i'd play my friends playing with Legendaries and it made me mad since they were using them, but I usually got over it, although there are times were I kill his Pokemon with ease. I mean there are already powerful Pokemon out there....I just don't want ppl with a steriod induced power team of legendaries in their party...for instance.......Mewtwo, Rayquaza, Ho-Oh, Lugia, Latios, and Latios....I just think thats just pathetic, but it's just my opinion...my bad if I have offended anyone. Well, a single Blaziken with Rock Slide, Blaze Kick, Earthquake and HP Ice killed a Rayquaza, Groudon, Latios, and Regice before succumbing to the almighty kYogre. My opinion: Little kids=00ber starter, and legends, Older=more well-balanced team. All I use is a Articuno. Using 1 legend or 00ber isnt bad, but having an entire team of them win your batles for you makes you look weak. In some terms that may be true, but if you raise those legendaries to their best and you raise that Blaziken to its best.....who would win the battle, Im thinking the Legendary would. All im saying is that a legendary is a legendary, it was born with those stats and most likely are on the top 50 Pokemon Max stats list as well. I makes me much more satisfying to know that if my pokemon can take down a legendary with ease, then I know I did a great job. I dont like using the legendaries... i dont have a problem with others using them except when they just have a belt of all legendaries -- thats just lame. like Gardevoir~ said: "Using 1 legend or 00ber isnt bad, but having an entire team of them win your batles for you makes you look weak." I don't consider anyone who uses legendaries a "n00b" or "a child", however, I do pity them since they cannot enjoy the game fully, because there isn't a challenge in using a team of Deoxys, Kyogre, Groudon, Blaziken, Latios, and Regice. 1 legendary per team is fine, anymore and its a bit dumb. The main point of the GBA games is to get some uubers. Mewtwo, Mew, Celebi, Legendary Birds, Dogs, and so on and so fourth. But meh. If Slaking didnt have the annoying ability (forgot the name) which causes it to relax every 2nd turn, it would be an uuber as I think one or more of its stats are better than Mewtwos and its uuber strong. So, a good, well balanced team is good, without uubers. I don't mind the use of Legendaries, but it is indeed rather annoying when some players throw six Legendaries into their team and expect to sweep through the battle. It's much worse when they actually do win, and gloat about it. As such, I would have to agree that one Legendary would have to be the acceptable limit as to the number of Legendaries that one should have in a team of 6 Pokemon. I get annoyed when someone has 6 legendaries, or more than 3, for that matter. To me, 1 legendary on a team is okay, but my team is made to be balanced. My team has two legendaries in it: Groudon and Latios. Groudon can basically sweep the E-4 by itself, so I don't use it in link battles (My friend just got Emerald about two months ago and hasn't had much time to play it, so she's not that powerful yet). Latios...ish-ish. Depends on how powerful the other person is. I love my legendary sweepers. And if you look at the winners of the Journey Across America, you will see why. Legendary sweepers win. I'm not sure why Nintendo is letting ppl use an all legendary team, that seems a bit like cheating don't ya think? For as long as I been playing pokemon I have never used one except that one time in the Gold version, I had a lv100 Entei and the guy was too strong. I know I hear yall having 1 is ok, but im gonna keep on rolling with my regulars because they're powerful as it is already. Well im still goin to play with non-legendaries and i'll still play against a team of legendaries, but this topic was meant for people to think about the strength of legendaries and how their outcomes can really affect a battle and that I wanted to know yalls opinion about them. i don't think it's cheating but i think it's cheap if u have to battle a friend and u told him'her not us legendaries and the use there most powerful legend. but i do use them in the eliet 4 because they are weak then. Im not really sure how our posts reminded you about ur old battles , maybe of the colors? Oh well I beat it was a nuisance fighting off the lv100 Lugia, good thing you had ur Articuno, but still it would'ev been better if u killed off that Lugian with a non-legendary am I right? i only use the legendaries if i really need to. I stopped useing them after i got in the battle frontier in emerald because they don't allow Lv.70 pokemon OR legends so i just stopped useing them...heck i haven't even played my emerald since i figured out how to save in my final fantasy tactics advanced. I'm not sure, but do some of the battle frontier trainers or brains use legendaries? I haven't played for a while so im not so sure, but how come they get to use them? Yes now i remember, and one of the trainers or brains also having , it's aggravating trying to take down those legendaries though, those friggin cheaters in battle frontier. I don't see how using Legendaries is "cheating". Everyone can use them. If you can't beat them with other Pokemon, then maybe you should use them yourself? It's like the old "If you can't beat em, join em" saying. And if you can beat them with other Pokemon, then good for you, and you have no reason to complain about their power. You have to tell me this, Legendaries are known for their strengths, and im not telling ppl to not use legendaries, I created this topic to know what others think about legendaries in battles. I'm not complaining about them, 'cause I know I can beat them, u even bolded the letter can to emphasize their abilities because I know you think they are strong and it's hard to beat them. Im just saying compare legendaries with regular pokemon and see the comparisons, but im not giving the message to not use them, 'cause I know they are there for a reason.